One of the best ways you can share information about your business or organization is with a brochure. Brochures help you get the word out about your offerings, and are easily mailed, handed out at events or meetings, or sent as part of a collateral package to prospective clients. 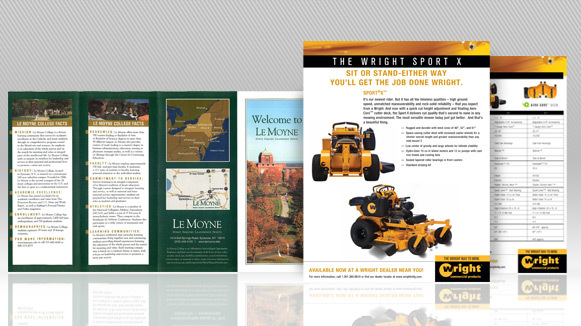 No matter how you want to use your brochure, Seaboard Graphics can help you create a design that’s truly your own. When you choose to design and print your brochure with Seaboard Graphics, we’ll help you showcase your company in a way that’s both beautiful and uniquely you. What’s more, we have the ability to print your custom brochure in full color and different sizes, so you’ll be able to create a piece that best represents your business or organization. Our graphic design team will work with you to develop a look that will make a great first impression. With custom brochure printing services offered by Seaboard Graphics, you’ll be able to select from different types of printing stocks. We’ll provide you with high-quality yet affordable printing papers, and offer you different printing sizes to best suit your brochure needs. You’ll have the option of printing on one or both sides of the paper, or use color prints on one side and plain black and white on the other. The design of your brochure is up to you – Seaboard Graphics will help you craft your unique vision into a custom, collateral piece that you’ll be proud to share with your clients. Whether you’re ready to print your custom brochure, or need help getting started, Seaboard Graphics is ready to help. Call us at 800-721-1663 or fill out this convenient online form and we will be more than happy to help.